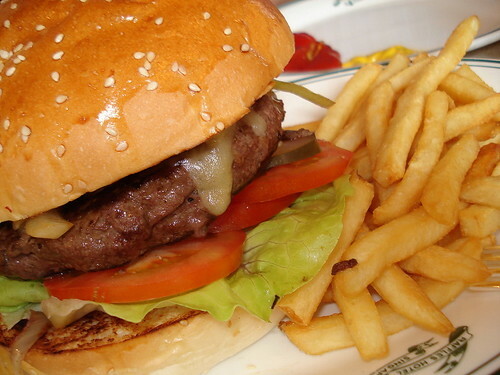 Texas Burger, originally uploaded by Camemberu. This has got to be the Holy Grail of all burgers in Singapore. Seah Street Deli's Texas Burger (S$21.75) offering a giganormous 12-ounce (nearly 350 grams!) beef patty with hickory BBQ sauce, smoked bacon, sauteed peppers and onions, melted cheese, pickles and veg (lettuce, tomato). Comes with a choice of side dish - the fries are good. It's a *huge* portion, easily shareable between two people. But size isn't everything about this burger - the taste as well is superlative...oh my, it's almost like eating steak! I'd be very sad the day we have to reduce cattle-farming to battle global warming. 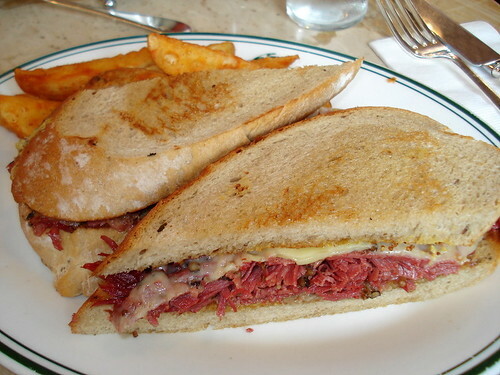 Reuben Sandwich, originally uploaded by Camemberu. We also shared a Reuben sandwich (S$17.95), again a generous serving of American style beef pastrami, sauerkraut, wholegrain mustard and melted Swiss cheese on grilled rye bread. I chose wedges for my side. Nice and crispy on the outside, meltingly good on the inside. The Reuben was also good but after I'd had a bite of the Texas burger, I quite easily forgot about it. Service was fast, friendly and impeccable, even though the place was packed at lunchtime today. The iced tea is free-flow (you can ask for syrup to be served separately). Seah Street Deli styles itself after New York delicatessens (complete with jukebox) but it's always looked a little dark for me. Perhaps it's the black and white tiles, dark chairs and whatnot. This joint is a little pricey for the size of my wallet but that burger is worth every cent. I am definitely coming back, cholesterol quotas be damned. wow, from the pics, I think the reuben sandwich seems to have shrunk greatly! It was much thicker be4! Really? I wouldn't be surprised, since beef is getting more and more expensive! But sorry, this is a bit of a 3/4 top-down pic (the one I took from the side was blur). Hmmm, looks like a burger I should go and try! Hello ieat! Yes, it definitely is worth trying. Would love to see how it compares with the Epicurious one. 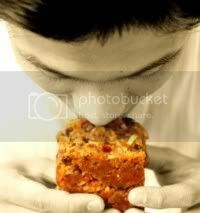 I love is the Reuben sandwich —beef pastrami laden with sauerkraut, wholegrain mustard and Swiss cheese on rye!! !